It is time for the biggest Belgian race of the season – the Tour of Flanders – a one-day classic that rewards combative and tactical riding. You have to go back to Gianluca Bortolami’s victory in 2001 for the last time the outcome was decided by a showdown comprising of more than five riders. Cycling Weekly assesses who is capable of being triumphant in this year’s edition on Sunday (April 3) and we take a look at back at past editions of the Ronde to see how the final outcome was achieved. For an in-depth preview of this year’s race, including a detailed look at the race route, see Cycling Weekly’s Tour of Flanders: The Big Preview article>>. The four previous winners of the Ronde who will take the start are all capable of being triumphant once again on Sunday. Cancellara and Boonen are both on, or near, top form, having taken big victories already this season, while Ballan has finished in the top five of the Strade Bianchi and Milan-San Remo. Only Devolder has had a quiet start to the year, which is his first season with the Vacansoleil-DCM team. Gilbert last week declared that the route of the race suits him after a reconnaissance ride of the cobbles and hills. Haussler has started 2011 better than last season, so could feature strongly. 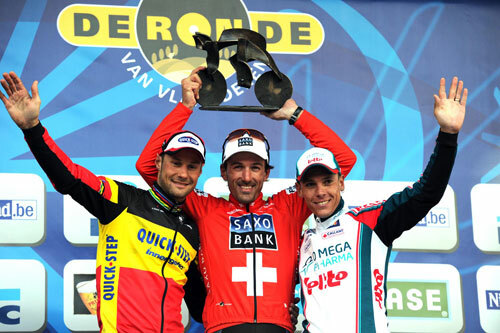 Flecha is always strong in the spring classics, while Hincapie (who has finished third, fourth, fifth, sixth, seventh and tenth here) is a useful backup for Ballan, Marcus Burghardt and Greg Van Avermaet. Having finished on the podium in Ghent-Wevelgem and Dwars door Vlaanderen – as well as taking a stage in the Tirreno-Adriatico – Tyler Farrar is certainly one to watch. The American finished fifth in 2010, three days before winning the Scheldeprijs, so can clearly deal with the short but sharp hills of Flanders. Langeveld won Omloop Het Nieuwsblad, and Van Avermaet, Stannard and Thomas are all on the verge of taking a notable win. Stijn Devolder and Fabian Cancellara both launched blistering attacks on the iconic Muur, famed for its sections of 19 per cent and a leg-sapping average of 9.3 per cent. Devolder won by 59 seconds, with Cancellara finishing 1-15 ahead of Tom Boonen, who had been out-front with the Swiss rider until he attacked. Cancellara’s attack became the subject of much debate, with some alleging he had used an electric motor to assist him. The four-time world time trial champion dismissed the claims as “so stupid I’m speechless”. several moves by riders seeking to bridge the gap to his then team-mate. Eventual winner Alessandro Ballan takes off on the Muur and only Leif Hoste can respond. Ballan looks beaten in the sprint, but pips the Belgian on the line. Tom Boonen responds to an attack from Hoste, and the pair ride cohesively to the finish. The Discovery Channel rider tries gallantly to drop Boonen, as he knows ‘Tornado Tom’ is the better sprinter; something that is proved at the finish.